Once your car door is stuck in the lock position, there is a process you have to do. It begins by finding out what is wrong. From there, get the door open to work on the broken car door lock. Finding a solution will depend on whether the car door is locked and won’t close or if the car door is locked and won’t open. Things might seem complicated, but if you read on, we will guide you through it. Finding your diagnosis for a car door lock stuck in the lock position is the first step to fixing the problem. Once you understand a little bit about each diagnosis, you can work out a troubleshooting method for a door lock stuck in the lock position.Because every situation has differences that don’t allow for a one size fits all solutions, knowing all the problems creates an understanding needing to find which issue you are facing. If a car door lock is stuck in the lock position, it is most likely due to a connection between one, several, or all, external and internal connections to the car door latch. 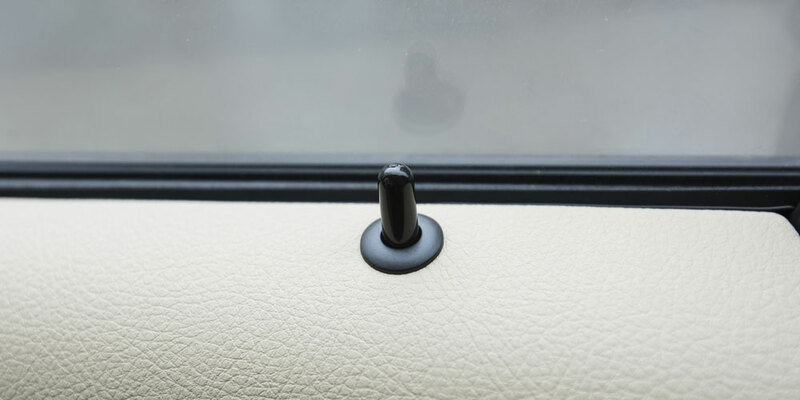 When your door handle, door lock cylinder, or interior locking post/switch, is not properly connected to the car door latch, you will find that the car door lock is stuck in the lock position. Besides something as obvious as having to remove a broken key from a lock, other things can build up or become jammed in the internal workings of a car door lock. These include rust, dirt that can build up in the lock assembly, or broken parts of the door that can fall and jam the interior assembly. You also can have other foreign objects that have been wrongly placed in the keyway. To take on issues with the lock assembly in the door, you need to open up the door panel and try to move the assembly. Look to see what is holding it up. Lubricate the assembly and try to move it again. Continue to lubricate and move the assembly. If you find that anything other than grime or rust is keeping the car door lock stuck in the lock position, remove the relevant blockage. This issue is much easier to solve if the resulting car door lock stuck in the lock position causes the door to not be able to close. The most difficult part of the solution is getting the door open. Once the door is open, the latch can be addressed. Perhaps the damaged part can be fixed, but structural damage almost always calls for some form of replacement. If the issue with the car door is that it will not close due to this issue, then you can move on to finding your solution. In other cases of a car door lock stuck in the lock position, the door will be closed already. Most solutions involving a car door lock stuck in the lock position require gaining access to the lock assembly inside the door, which is difficult to access with the door shut. When the car door is stuck in the lock position, hopefully, it is not the case that the car door will not open from the inside or outside. Begin trying to open your car door by all available means. This includes using your car key remote, manual manipulation of the interior post/switch locks, and using the key in the door lock. Hopefully one of these methods will open the door. If nothing works, then you need to gain access to the inside of your door. There are instances where you can remove parts of the interior door panel while the door is closed, but this is just another way of getting the car door open. It might not be an opening you can walk through, but it is an opening in the door. These openings can be made by unscrewing self-contained panels on the overall door panel. You will need the interior door panel to be opened in some capacity to fix any car door lock stuck in the lock position as a result of an issue with the door assembly. You need to be able to interact with this assembly to some degree in order to get the car door open. Once the car door is opened via your limited access to the trouble spot, you can go about truly finding a lasting solution beyond what it takes to unlock the door a single time. Where you might be able to drive with a car door lock stuck in the lock position when it won’t open, it is not advisable to do so when the car door will not close. Though your mobility may be reduced because of this issue, you will have a simpler time fixing the problem. Locate the latch on your car door. Find the hole or gap that is meant to catch on the hasp of the car door. Insert a key, pen, or other thin and long tool into the gap. Flick/push the latch toward your car in a semi-upward motion. Once the door is able to be shut, it would be advisable to not lock your door again until the issue has been resolved. A door lock that is stuck in the lock position only becomes more complicated when the door won’t open. If there was nothing you could do to get the car door lock open when the door was open, then it is unlikely that you will be able to get it open when the car door locks in the closed position. The first thing that you should do is refer to the section above on “Getting The Car Door Open”. It is not ideal, and often not possible, to work through the issue without having the car door open. You can work through getting the car door unlocked yourself, but if you are willing to take on the cost of having a locksmith unlock your car, you can take away some of the stress of this endeavor. Check all available ways of opening the door (remote, keys, interior door locks, handles). If nothing works to open your door, go to the interior of the car and face the interior side of the door lock stuck in the lock position. Locate and remove set screws for the door panel. If the door panel cannot be opened enough to reach and view the door lock assembly, search for possible partial disassembly. With access to door lock assembly, attempt to manipulate both the assembly and the interior door lock. Search for a temporary way to open the door and move the latch. For anything that cannot be moved or is not moving regularly, there is the solution presented by lubrication. I would recommend something like a dry lubricant for the long term as it is often the case that oil-based lubricants can attract dust and dirt, which will lead to this problem resurfacing. With enough rust or grime built up, you should not only lubricate the stuck parts of the assembly, everything must be cleaned. After cleaning to remove rust from old locks, lubrication should be used again to make sure that everything is moving smoothly. Proper lubrication and cleaning are needed to make sure that the fix maintains over time. For the case of repairing a car door lock stuck in the lock position solutions will almost always dealing with binding broken connections. If you are using glue, it is paramount to have the right binding agent for the materials that you are gluing together. For example, plastic and metal will need different glue, and different glue will be needed to bind plastic to metal. You can also use all manner of fabrication methods such as cloth tourniquets, screws, etc. All of this is very complicated if you do not understand the lock assembly, let alone if you are untrained in the repair you are using. It is usually a good idea to contact a locksmith for help with issues of repairing a car door lock stuck in the lock position. For replacement parts, you need access to the proper replacement parts. It is possible to find these parts online, but more than likely you will need to purchase more than just the part you need replacing. It is up to you to weigh the cost versus the reward of having a functional door lock. 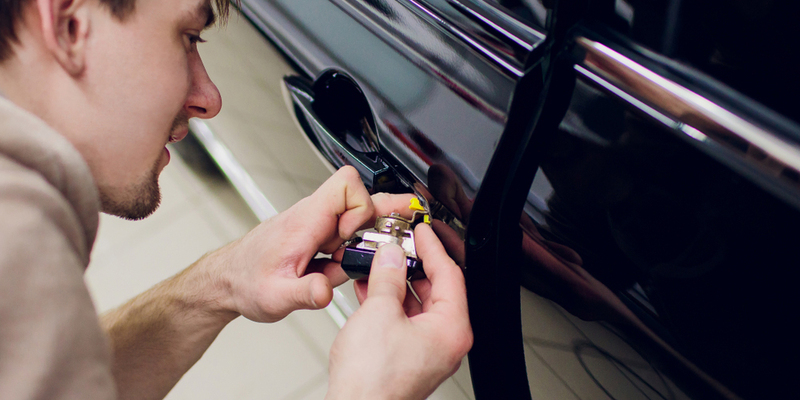 If you would like to contact a car locksmith or specialized automotive professional, they can help with the purchasing and installation of any and all replacement parts. It may be beneficial to have a pair of expert eyes on this type of work to reduce the risk of further damage and the purchase of incorrect parts. Though I have mentioned calling a locksmith several times already, I just wanted to hit home the importance of knowing that a car locksmith can help with any and all aspects of fixing a car door lock stuck in the lock position. If you are worried about how much a locksmith costs, it is important to weigh that against the value of your time and the likelihood of making a mistake. A locksmith is the best option you have for diagnosing the problem, let alone working out the solution. You need to know what is going on with a car door lock stuck in the lock position because of how many causes there could potentially be. Never hesitate to call a locksmith for this type of help if you have any doubts about your knowledge or ability. Any door lock stuck in the lock position can be fixed. If you do not fix the issue, you are not using your automobile to its fullest potential, and you are diminishing the value of the car. These can be simple fixes, and they are important to make. In order to get the most out of your property make sure you fix any car door lock stuck in the lock position.